created September 7, 2011, last updated March 6, 2018. This post was last updated 7 years 7 months 11 days ago, some of the information contained here may no longer be actual and any referenced software versions may have been updated! DSS no longer compiles and runs new Ubuntu versions. If you want to use Darwin Streaming Server run it as a docker container using my DSS image. 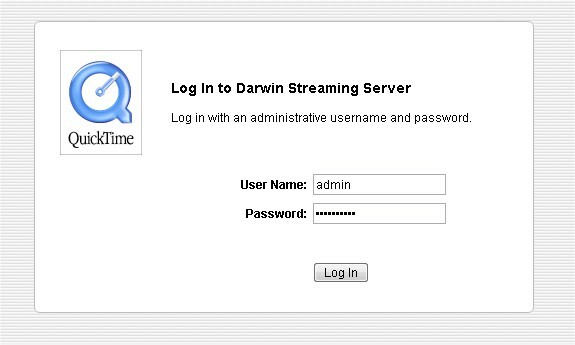 Over the last few years I have been involved with some projects that required streaming audio and video solutions and I have been working with the Open Source Darwin Streaming Server from Apple running mainly on the Linux platform. DSS will run under Windows but I wouldn’t recommend it. The Darwin Streaming Server (DSS) is the open source version of Apples quicktime server technology which is built into Apples OS X Server. DSS can run under Mac OSX, Windows and Linux. The streaming server supports QuickTime Movie (MOV), MPEG-4 (MP4), and 3GPP (3GP) “hinted” files. Support resources for DSS are quite limited so I will start to post information here to document some of the work I have done with DSS, including installation, configuration, use etc. This first post will document the compilation, installation and testing of the current version of DSS, v6.0.3 under Linux. The commands below assume you have superuser rights. To compile DSS we first need to make sure we have the required packages for the download and compile utilities. Execute the following as a superuser, or use the sudo prefix command. Need to get 19.6MB of archives. Hit Y to download and install the required packages. Rename the source file directory to allow us to create a patch directory. The patches are required to compile DSS under a 64bit OS, but there is also no harm in applying them if you are using a 32bit OS. Now is a good time to grab a coffee as the build process could take a few minutes. The various warning messages you will see can be safely ignored and unless you experience another serious error the compilation is completed when the command prompt returns. The install script creates the DSS directory structure and copies files and sample media. When complete you will be prompted to create an administrator username and password. Enter the username and password you will use to administer DSS. Confirm the password. Check permissions for the DSS configuration file in /etc/streaming, it must be writeable or the changes made in the administration pages will fail. Failed to start Streaming Admin Server. Port 1220 is in use by another process. The Streaming Admin Server may already be running. and update rc.d to so that it can auto start and respond to start/stop commands. You will see the DSS login page, login with the username and password you created during the installation and click the Log In button. Enter the MP3 broadcast password you wish to use and click next to continue. The setup assistant will ask you if you want to use Port 80 for streaming “This allows you to stream through firewalls.” Streaming on TCP port 80 instead of default RTSP ports will ensure that streaming clients behind most firewalls that might have none standard ports, such as RTSP blocked, will be able to access the streaming server via TCP Port 80 which is commonly used for HTTP access and is more likely to be permitted through firewalls. I recommend considering this later as you need to be sure that any existing services running on Port 80, i.e. Apache have been modified or stopped before you try and use DSS streaming on Port 80. Click the Finish button to continue. 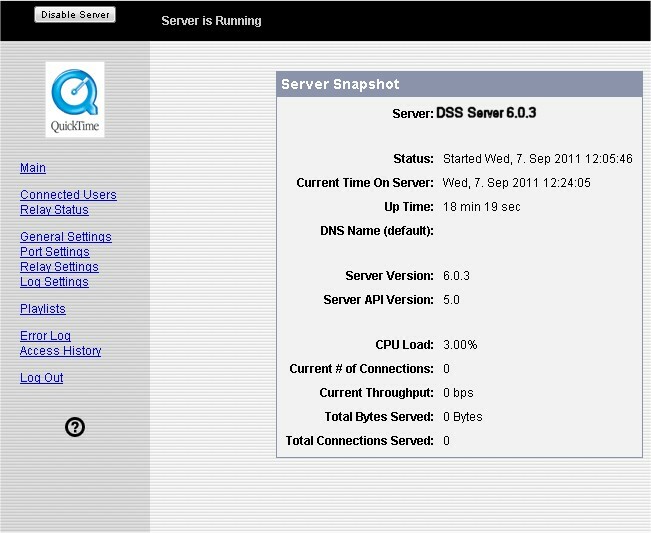 The main DSS administration screen will appear and the DSS installation and basic configuration is complete. Make a tarball of your install directory and save it somewhere for future use! If you look in the default media directory (/usr/local/movies) you will see some test audio and video media files. The 300Kbit h264 sample MP4 file will stream from your server and should play in your media player. DSS Uses the following default directories for config, playlists, logs etc. I will look at configuring the server further and preparing media for streaming in another blog post. Looking for a media player for darwin mp3 streams – check out the facebook darwin media tab demo on my facebook page. I followed all the instructions for the installation. Why am I getting this message? Have you checked the permissions : chmod 755 /etc/streaming/streamingserver.xml What operating system are you compiling it on, the streaming server will not compile under newer OS versions, check out my docker container for DSS for a working docker version of DSS. hello, your docker container for DSS is gaiterjones/darwin-streaming right? and the docker container run command is ? default admin password is ? login to admin via http://server:1220 using the username and password defined in the run command. The sample video will play. If you create a playlist replace the sample video with the playlist name, i.e. stream1.sdp.